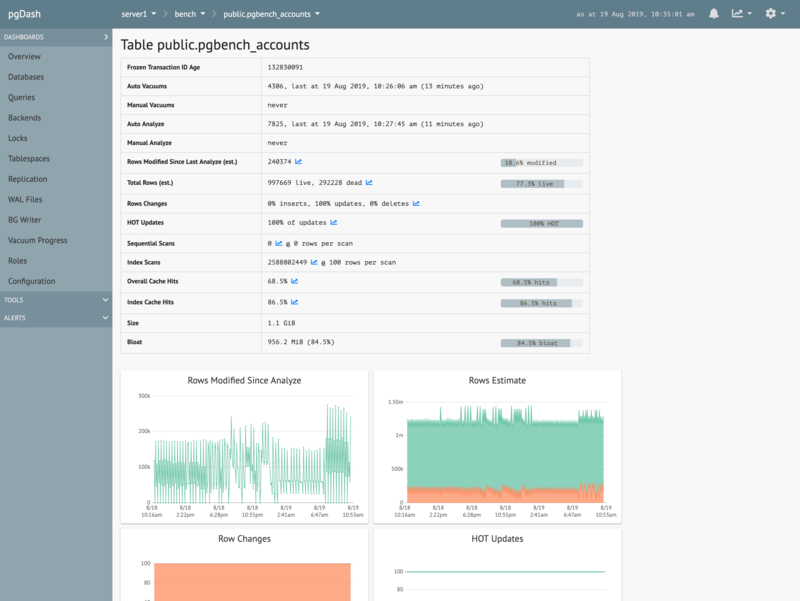 pgDash is a comprehensive diagnostic and monitoring solution designed to help you ensure the ongoing health and performance of your PostgreSQL deployment. pgDash provides core reporting and visualization functionality, including collecting and displaying PostgreSQL information and providing diagnostics, time-series graphs, detailed reports, alerting, teams and more. 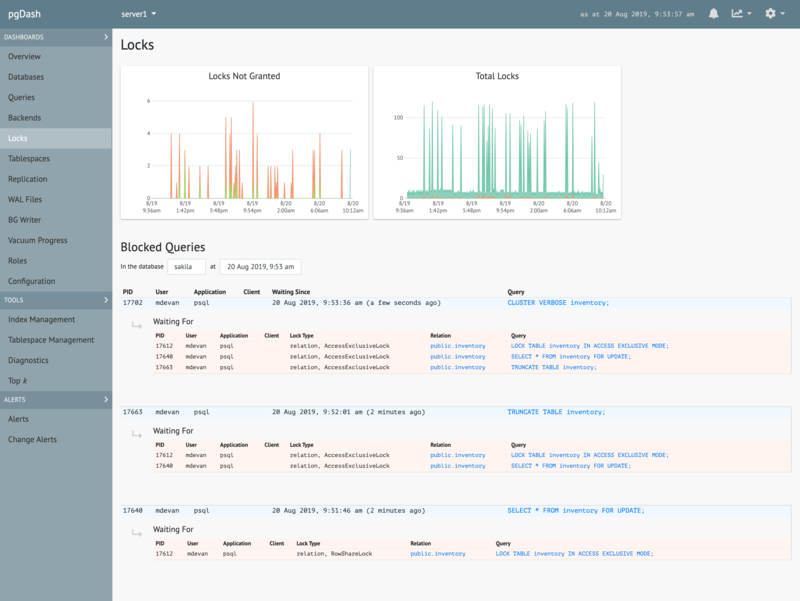 SaaS and self-hosted/on-premise options available. Collect PostgreSQL data, in JSON format, using our open-source tool pgmetrics. Send it to pgDash regularly, using the pgdash command-line tool. 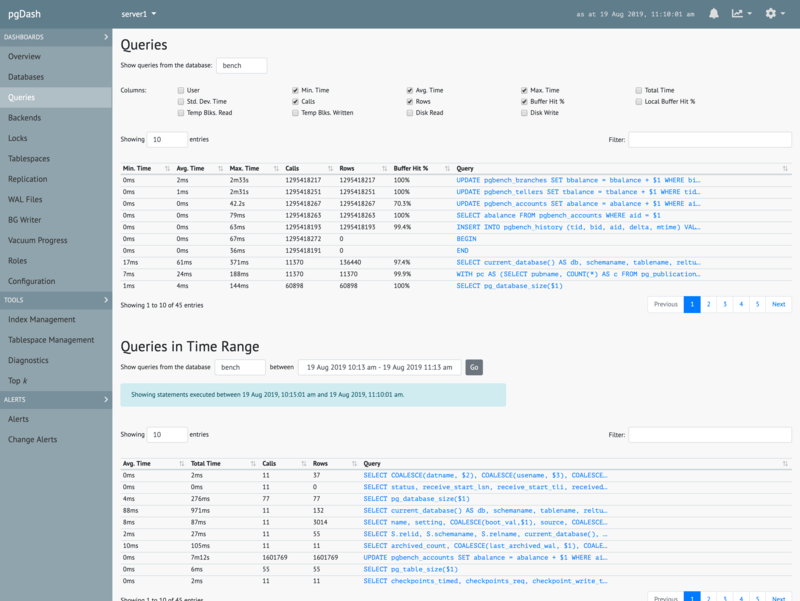 pgDash shows you information about each table and index, like size, bloat, activity, vacuum and analyze information, cache efficiency and more. See which queries and waiting for which others. Track backends waiting on locks, transactions that have been open too long, idling transactions. 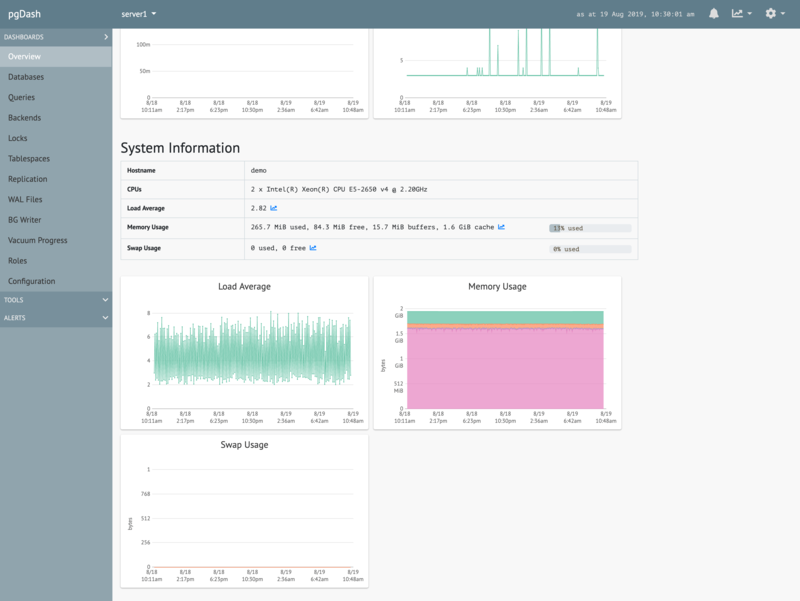 Load average, memory usage, swap usage, and tablespace-wise disk usage can also be collected and monitored. Interactively filter and browse slow SQL query information collected from the pg_stat_statements extension. Identify queries that run slow, cause too much disk activity or are cache-inefficient. 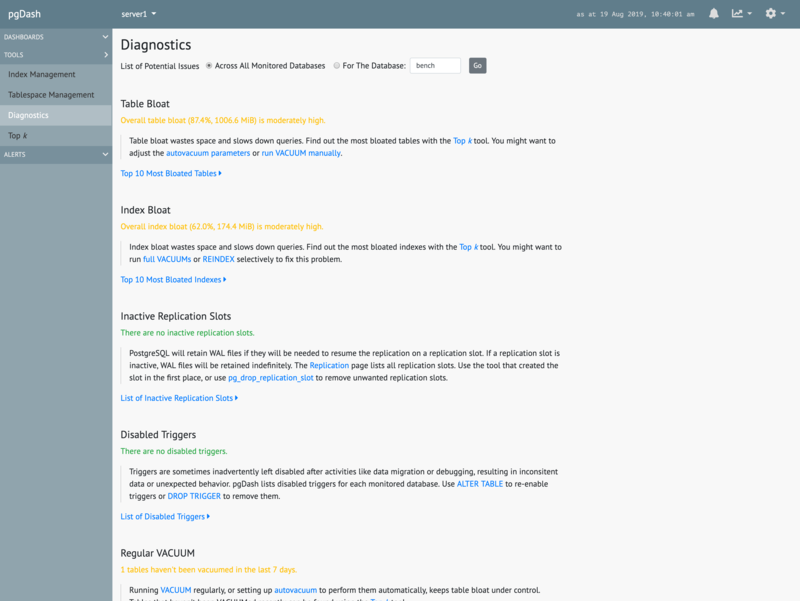 Diagnostics examines your PostgreSQL server and databases scanning for potential issues that can impact the health and performance of the deployment. 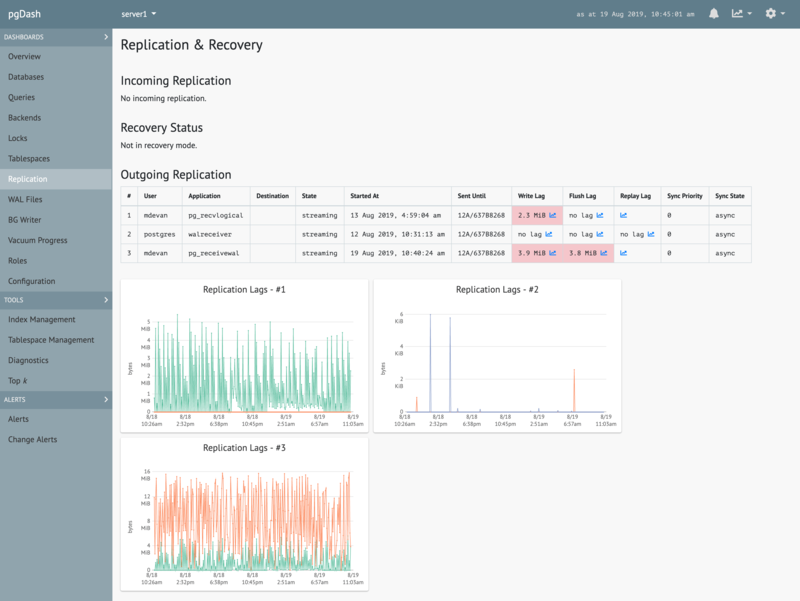 Monitor extensive replication metrics, including lags at primary and standby servers, physical and logical replication slot information, and standby recovery progress. pgDash lets you share all the data for a server with your team members. The team member you're sharing it with can view all information, metrics and graphs, but will not be able to delete any server data. Team sharing is available in the Pro and Enterprise versions of pgDash SaaS and self-hosted / on-premise. pgDash Basic Alerting lets you set meaningful alerts, like “Commit Ratio of mydb is less than 80%”, “Number of backends waiting on locks is greater than 30”, and get notificatied via email, Slack or PagerDuty. Change Alerts automatically inform you about important changes to your PostgreSQL databases, like addition or deletion of users, tables, indexes, or abrupt increases or decreases in table size, and more. Change Alerts are available in the Pro and Enterprise versions of pgDash SaaS and self-hosted / on-premise. WAL archiving information, BG Writer stats, vaccum progress information, roles including group membership, configuration settings. On-premise option so you can run pgDash yourself if you prefer. Please let us know your email, and we'll get back to you soon! Your email was successfully added to the list.